A recent wave of articles, mostly from New Zealand and Australian media, criticized the direction taken by the Fiji authorities following the abrogation of the 1997 Constitution in April 2009. These articles should be seen as yet another example of "parachute journalism," where journalists are sent to political trouble spots to compile informed analysis when they have little understanding of the socio-cultural context. On the face of it, it is claimed that Fiji is under a dictatorship, but Fiji had gone through this path before, so why overseas media and their willing interviewees are surprised and shocked by the unfolding political events in Fiji begs belief. In 1987, the democratically elected multiracial government led by an indigenous Fijian doctor, Timoci Bavadra, was deposed in a bloodless coup by Lieutenant Colonel Sitiveni Rabuka, who was quickly promoted to the rank of Brigadier General by the late Governor General of Fiji, Ratu Penaia Ganilau. In 1987, Indo-Fijians were a majority in Fiji, and they complained to the international community that an elected government was ousted at gunpoint and democracy was destroyed by indigenous nationalists. However, the same international community, including Australia and New Zealand, remained silent, and policy makers in these countries actually accused the Indo-Fijians of undermining indigenous interests, thus supporting the nationalist position. At best, both Australia and New Zealand allowed skilled Indo-Fijians to emigrate, and this trend has continued since. Fast forward 20 years later, and the indigenous Fijians who benefitted from the 1987 coup suddenly found themselves, like their Indo-Fijian counterparts in 1987, under the gun of an indigenous military leader Frank Bainimarama, who became fed up with indigenous nationalism and the associated cronyism and patrimony. The very people who supported the destruction of democracy in favor of indigenous rights in 1987 are now champions of democracy and rule of law, while Indo-Fijians—reduced from close to 48 percent of the population in 1987 to just little under 37 percent in 2006—have transformed into avid supporters of the "undemocratic" actions of the commander. The contradictions in both these communities are caused by the complex trajectories of history that Australian and New Zealand media are refusing to comprehend and policy makers overseas are adamant to acknowledge. Hot on a mission to sensationalize and exaggerate Fiji's political situation, regional media played a major role in the 2000 coup where anti-Indo-Fijian arguments were published in the local press, unchallenged by the Australian and New Zealand journalists, as indigenous thugs held an elected government hostage for 56 days and unleashed unprecedented terror and violence against Indo-Fijians living in rural Fiji. With unrestricted access to the 2000 coup leader, George Speight, local media created a misguided view that indigenous nationalists were once again reacting to the tyranny of Indo-Fijians and, in particular, their leader, Mahendra Chaudhry. In 2000, indigenous Fijian traditional institution—for example, the Great Council of Chiefs—was divided along indigenous confederacy and provincial lines because indigenous cultural logic dictated that chiefs from the provinces involved in the Speight coup supported them, despite the fact that rule of law had been effectively compromised. The Australian Government, which has now taken a moral position on democracy and is deeply worried about the impact of a coup culture in the South Pacific, remained an impotent regional observer, along with its counterpart New Zealand, as Fiji descended into anarchy. The political establishment that came into power following the Speight coup continued with the agenda of the indigenous nationalists. 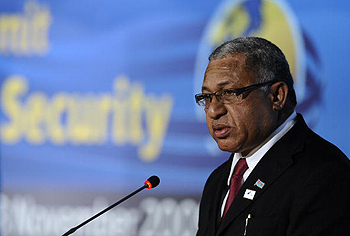 In 2003, reports surfaced that the commander of the Fiji Military Forces, Frank Bainimarama, had become increasingly uncomfortable with the elected government, in particular with its policies to appease indigenous militants. A series of events started over a three-year period resulting in the December 2006 coup. Initially, the military government attempted to work within the 1997 Constitution, but this position became untenable following the judgment by the Fiji High Court that the 2006 political order established by the 2006 takeover was illegal. Overseas media alleged on many occasions that Commander Bainimarama executed the coup to scuttle the investigations into the deaths of eight Counter Revolutionary Warfare Unit soldiers who were allegedly involved in a mutiny at the Queen Elizabeth Barracks in Suva in November 2000. These allegations, while sounding quite serious, ignored the fact that there was a bounty on the head of the commander in 2000 for refusing to acquiesce to the demands of the indigenous chiefs who supported the Speight coup. It was a dangerous situation of kill-or-be-killed. Supporters of the commander rounded up and interrogated the mutineers and their associates, and some interrogations resulted in death. Human rights conventions abhor deaths in custody, but following the events of 2000, there were deep divisions within the army that had the potential for prolonged violent internal conflict. Moreover, following the 2006 coup, the military discovered a number of irregularities in the manner in which the Native Land Trust Board (NLTB) conducted its business with respect to indigenous land. Much has been written and discussed on the rate of return on indigenous land leased by Indo-Fijian farmers, but a greater and a more interesting story relates to the way elected indigenous nationalist governments conducted business with overseas commercial interests with total disregard for indigenous land rights. As a result, the military government "cleaned up" the NLTB. There are endless volumes of information compiled by the Fiji Islands Independent Commission Against Corruption that point to past indigenous Fijian leaders exploiting indigenous Fijians and their resources for personal gains. The details of official corruption in Fiji make for very dry reading and do not fit into the agendas of Australian and New Zealand media and, as a result, we never hear about them, except claims that "corruption and mismanagement is often overstated by the military to support their own agenda." Overseas media are interested in understanding the resilience of indigenous Fijians who have yet to rebel against the Bainimarama regime. The media hopes to overturn an authoritarian system and in its place establish a nationalist indigenous government based on ethnic division as it existed from 1970 to 2006. There is no choice for the Indo-Fijians who are currently supporting the Bainimarama Government because, on the face of it, the Bainimarama regime has offered a "non-ethnic political solution" while the indigenous nationalists want continuation of "positive discrimination," as stated in the deposed government's political manifesto of 2006. The question is still asked as to why the Fiji regime has suspended freedom of the press indefinitely in Fiji. The answer is quite simple. The press has, in the past, attempted to instigate ethnic hatred and destabilize the Fiji government. Overseas-owned newspapers in Fiji have continuously emphasized the need for quick elections and democratic rule, but they have yet to make a case for addressing deep-rooted institutional and ethnic problems in divided communities. What could be done to cement multiethnic democratic values does not fit within "commercial parameters" of contemporary journalism. Overseas media have little idea of the socio-cultural history of Fiji, including the emphasis on communal politics established by the British colonial rulers to support their indirect rule of the colony. While many indigenous soldiers have sacrificed themselves for the Commonwealth and the empire and continue to volunteer to fight in failed states like Afghanistan and Iraq and replenish war-weary soldiers from "democratic" nations, there is lack of appreciation on the part of Australia and New Zealand journalists for the complexity of Fiji's multidimensional problems. Past indigenous Fijians as well as Indo-Fijian leaders have failed Fiji because they were interested in protecting their own communal hive. Since independence of Fiji in 1970, Fiji has oscillated between ethnic conflict and conflict between elected and appointed entities, and these conflicts are yet to be resolved. To argue that democracy is a "magic bullet" that will solve Fiji's problems is naïve. Previous initiatives to move Fiji towards a non-ethnic model were comprised by indigenous nationalist assertions, and the current regime should be allowed to implement its reforms without interference. Sanjay Ramesh is an adjunct research associate in transforming cultures at the University of Technology in Sydney and is currently completing a research degree on inter-group conflict in Fiji at the Centre for Peace and Conflict Studies at the University of Sydney. Send comments to sanjay.ramesh@uts.edu.au..